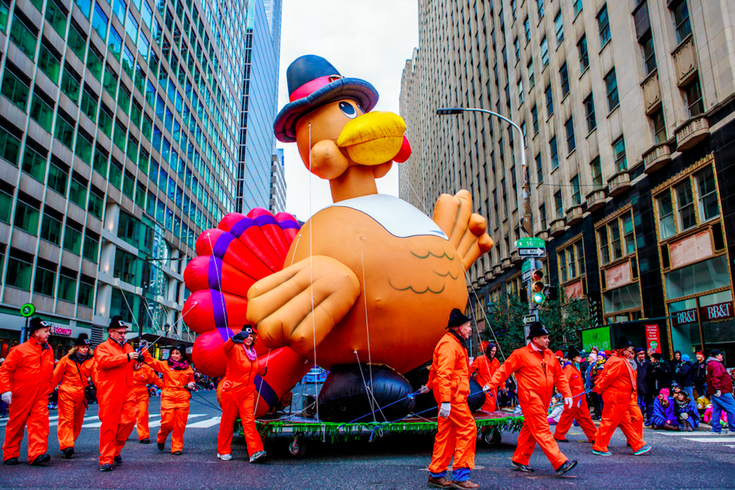 The oldest Thanksgiving parade in the country is almost 100. The oldest Thanksgiving Day parade in the country takes place in Philly. This November, the parade turns 99. For many Philadelphians, standing along the Benjamin Franklin Parkway to watch giant balloons and floats pass by is the perfect way to start the holiday. Below we've created a go-to guide with info on when the parade starts, this year's special guests (including Gritty), the weather forecast and the best place to watch along the route. On Thanksgiving, expect clear skies but make sure to bundle up before heading to the parade. The forecast for Philadelphia from the National Weather Service predicts Thursday will be sunny, with a high near 30. There will be 12 mph winds. The Parade Zone at Eakins Oval, in front of the art museum, is one of the best places to watch the action. This year, American Heritage Credit Union's money machine will be there. Parade-goers can step inside and try to quickly grab as much cash as possible. Also at the Parade Zone, there will be free coffee, a photo booth, a chance to win an Eagles jersey signed by Carson Wentz, dancing, face painters and balloon artists. This year's floats include "Pirate's Life" from Ram Trucks, "Fairy Tale" from Geico and "Rollin' on the Riverboat" from NRG Energy. As for balloons, there will be an array of recognizable characters, including Dr. Seuss' Thing 1 and Thing 2, Daniel Tiger, Waldo and Brainy Smurf. The Philadelphia Thanksgiving Day Parade boasts a large lineup of special guests each year. Below are some of the most notable guests making appearances for the parade's 99th year. • Ginger Zee from "Good Morning America"
• The Grinch from "Dr. Seuss' How The Grinch Stole Christmas! The Musical"
• Cast of the "The Lightning Thief: The Percy Jackson Musical"
• Cast of "Rodgers + Hammerstein's Cinderella"
• Doug E. Fresh – also known as "The Human Beatbox"
There will also be marching bands, dancers, choirs and other performers to watch for on the parade route. The 6abc Thanksgiving Day parade has aired on Channel 6 since 1966. Those watching the live broadcast on TV have chances to win prizes. Look for keywords to text and win. Prizes include free Dunkin' coffee for a year, tickets to the Eagles game on Sunday, Dec. 23, and a trip to Hawks Cay Resort in Florida. There's also the option to watch the live stream online via 6abc's website.